Julie Newmar as Catwoman from the camp 60's Batman series. Love this artwork! Saw it as sideart on TeeFury (I bought several of your Han/Chewie/Calvin/Hobbes shirts) and sought you out. 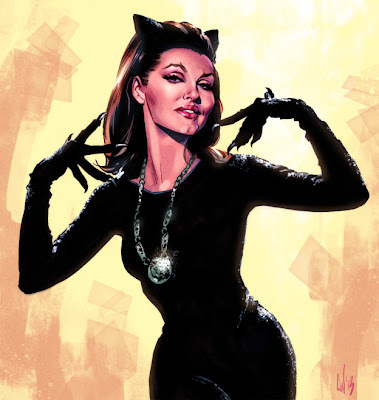 Is this Catwoman artwork available somewhere?? Asking the same question as rickrickrick, also after seeing it on TeeFury. Love it!!! You'll be able to buy prints of this soon from me. I'll keep you all updated.